Yeah I did a retexure for all cj faces on the original texture size, under the name lowpolyped. That was a lot of work so I can't imagine high res for everything in the game! Start some new project will be refreshing for this part of the site to have us both active. Seen it actually! great work buddy, keep it up. I was undercover - didn't want anyone requesting CJ stuff sorry for the heartbreak. Only issue I see is I get this weird squinting look often where his lower eyelid blocks half of his iris. I'll look in to that asap. You seem to be able to do a lot of stuff like adding clothes very easily. Editing the. ymt file is hard for me too. 1. Did you manage to get his voice files in? 2. Are you using CJ as an addon ped or his own dlc? 3. Can you show me your godly ways? I have cj's voices. But for franklin, I can help you for voice lines pains etc, If you accept..
You can't add voices, you can only replace. Replacing Franklin or any SP ped is not an option for me so I decided to replace an online exlusive peds voice. Silenced that ped (no longer talks) and assinged his voice archive for CJ. Then moddified the archive with CJs voice. The rpf is still incomplete though. 3. Yes just let me know what you need. Maybe impossible or not, just I have made for franklin..
CJ with his cousin, "Trailer CJ"
@CleoModlar- Sorry but your screenshot won't load for me. OH sh*t! Will you convert to franklin? Or How Can I convert to Franklin from easy way? Tshirt coming in again soon. I could see your perspective on CJ in HD being what Rockstar had in mind when creating the original. CJ in San Andreas doesn't come off as a former gangster, street thug, gang member...but your version is more menacing but handsome. 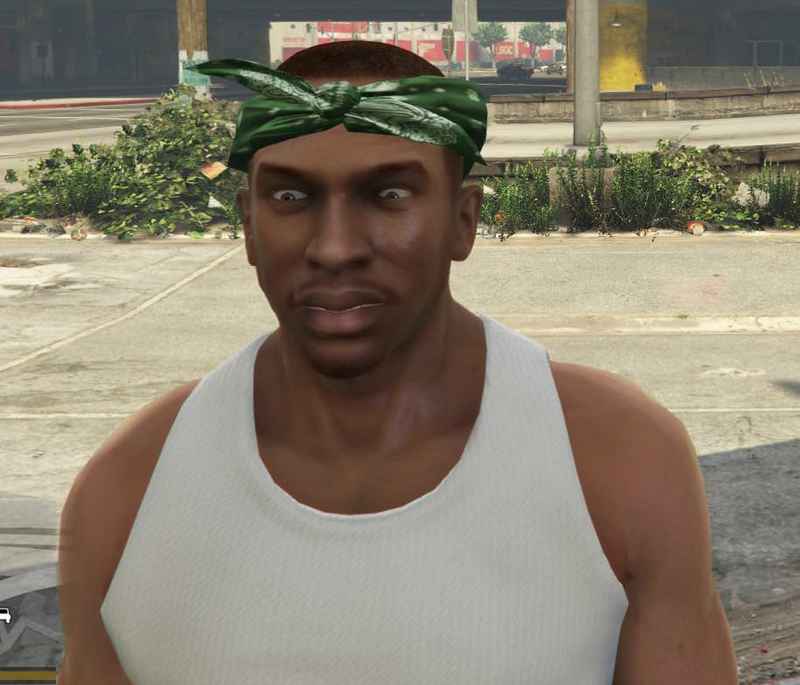 Not sure if this will ever get ported to San Andreas but when the updates are released, I'll definitely add him to GTA V.
Here's the thing, the author says the special ability doesn't work when using a different model than player_zero, player_one or player_two and he's right it doesn't work with addon characters. Character-swap along with something I set in the DLC I pm'd you earlier enables Franks special ability (vehicle slow mo). To activate it you have to spawn CJ using the name "carlj" and then using character-swap set him to any of the main protagonists. It doesn't matter which protagonist you set him to in character-swap, it will always use Franks special ability. Only issue is that special ability weird slow mo sound doesn't play because its tied to the main characters voice bank and "carlj" is set to use another voice bank. Honestly I doubted the new model at first, after a few of these fixes and updates you've made. It already is looking to be 10x better than the old model. Why are you so determined to replace Franklin when there is no need to? You can replace Franklin but it will be extra work for no gain. 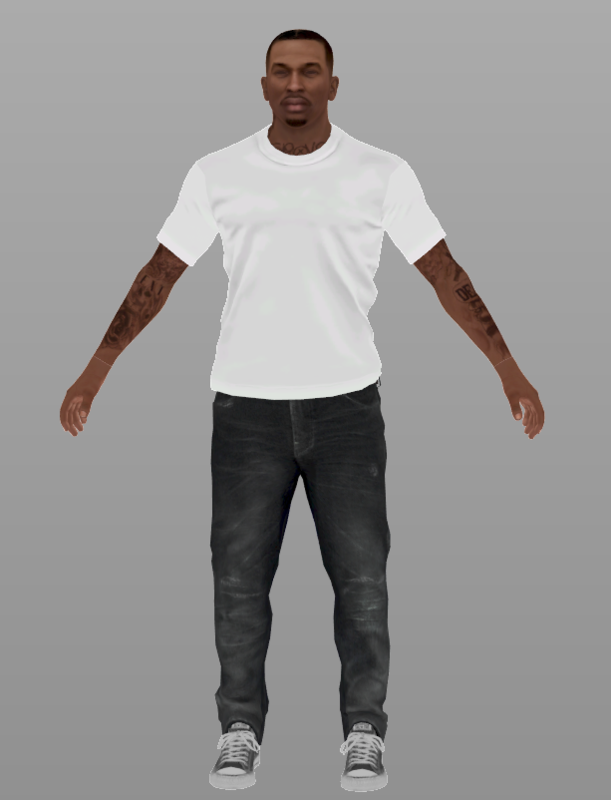 You can't use any of Franklin's clothing because this model is not rigged to Franklin's skeleton like the old beta model was. 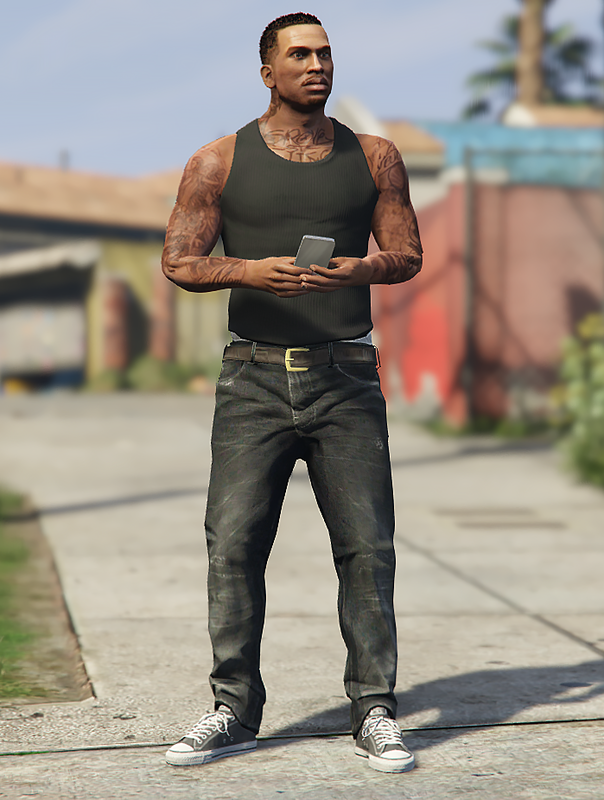 The character-swap mod AC linked you to allows an Addon ped to play missions as Franklin, use Franklin's money, phone, safehouses and even call Trevor/Mike/Lamar to hangout with them. The only thing you currently can't do with character-swap is hear Franklins voice outside of mission dialogue and use his special ability. 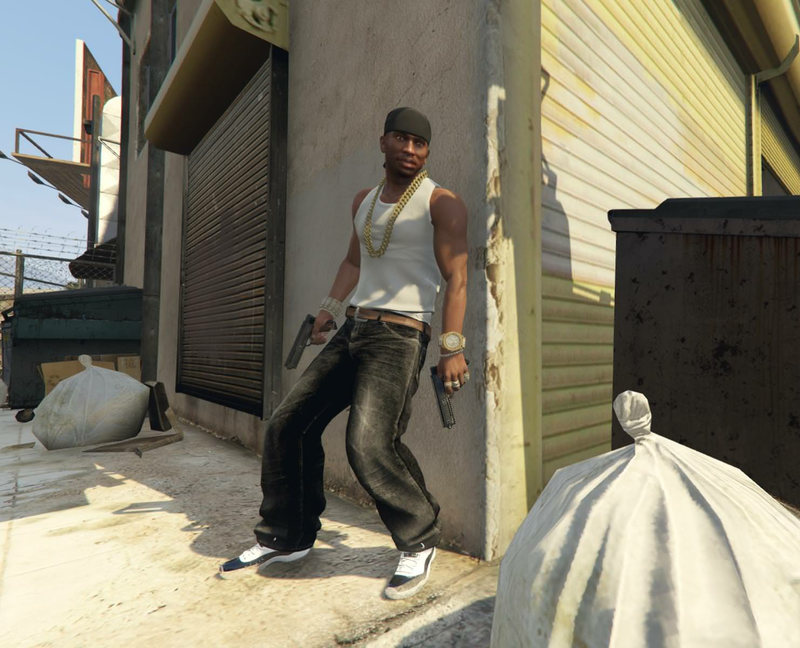 In future updates CJ will have an expanded wardrobe, his own voice and Franklin's special ability making it further pointless to replace anybody. For Franklin's clothes to work the model needs to be rigged to Franklin's skeleton. You need to have access to the files, a paid tool for model rigging and knowledge of how to rig models in order to get that done. Ped props (caps/glasses), voice and special ability all work in the DLC.rpf I sent AC. Its up to him when to release it. For Franklin's﻿ clothes to work the model needs to be rigged to Franklin's skeleton. That Is awesome bro! Thanks for your help again. Gonna be honest, the new CJ model doesn't look as good as the 2nd version. Doesn't seem as accurate. Good work on the tank top though, glad to see you're making progress with Zmodeler and rigging. Then you can go use one that was ripped right out of the 3D universe. There's plenty of them on GTA 5 mods. Also, you quoted an old comment from Ze-Krush.